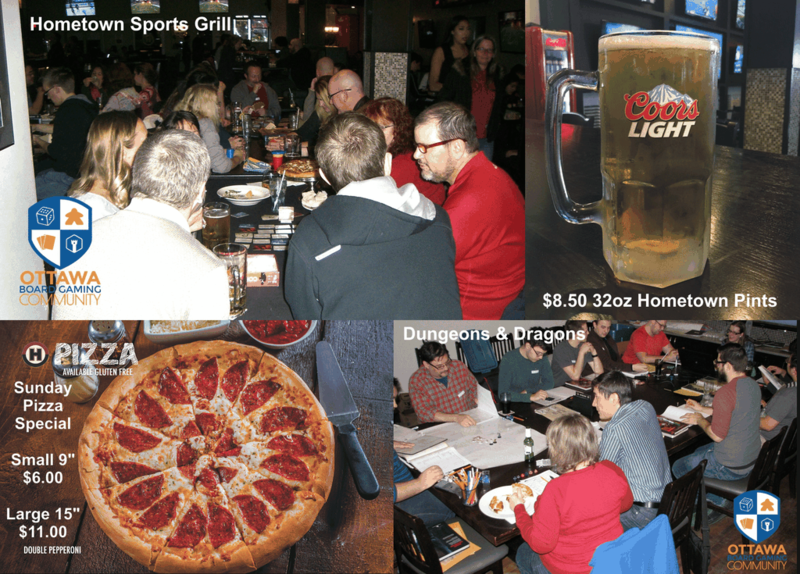 Hometown Sports Grill has invited the Ottawa Board Gaming Community to host a board gaming night each and every Sunday on Bank St. This event is free with ample free parking. Attendance: We typically get 40-70 gamers each week. The Ottawa Board Gaming Community is a Meetup Group with over 3000 members and a game library of over 300 games. Our meetups have more of a socializing aspect versus a competitive gaming environment so come join us on our next meetup to have a laugh, a bite to eat and meet some interesting people to play all sorts of board games with. First time attending? You do not need to bring any games unless you have one you would like to play. When you first arrive, there are typically 4 organizers waiting to greet you and get you a name tag. Due to the large size of our group, it is easy to find people to play with and teach games. We are also hosting a weekly D&D 5th Ed sessions at Hometown. We currently have 4 campaigns in progress, any of which you are welcome to join, players of all experience levels welcome.